The ulnar nerve is often called the funny bone at the elbow. However, there is little funny about injury to the nerve. When this nerve is irritated either by trauma or compression—it causes pain, numbness, tingling or burning into the small finger and part of the ring finger. The ulnar nerve is one of three nerves which make the hand work and feel. The ulnar nerve is responsible for approximately 50% of our hand strength. The most common site of compression of the nerve is the inside portion of the elbow—the cubital tunnel. The ulnar nerve, like all other peripheral nerves begins in the spinal cord and accesses the arm via the brachial plexus. As the nerve then travels down the arm, the nerve gains access to the arm at the level of the elbow on the inside (medial) aspect. The nerve travels through a defined space in the elbow termed the cubital tunnel. This “tunnel” which the nerve traverses is fixed in size—any inflammation of the tunnel causes compression of the nerve leading to numbness and tingling felt in the hand. A left elbow viewed from the side—the ulnar nerve runs along the inside of the elbow deep to the triceps muscles before crossing into the cubital tunnel. There are three nerves which make a normal hand function. The radial nerve gives sensation to the top of the hand. 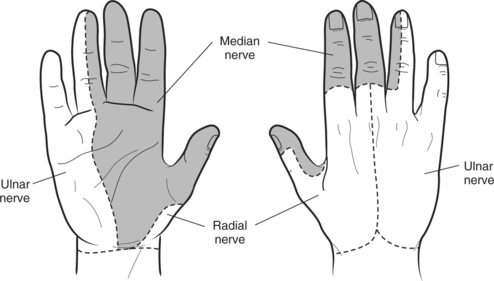 The median nerve gives sensation to the thumb, index, middle, and the half of the ring finger on the thumb side. Classically, the ulnar nerve gives sensation to the small finger and part of the ring finger. The ulnar nerve also supplies most of the muscles of the hand and gives approximately 50% of the grip power for the hand. The ulnar nerve function allows the hand to work in smooth unison. This is the classic distribution and wide variation is known to exist. Patients report numbness, tingling or burning in the ulnar nerve distribution of the hand discussed above—small and part of ring fingers. The symptoms may be worse at night, as we tend to sleep without elbow flexed, further compressing the nerve. Patients may also notice the symptoms are worse during the day when the elbow is flexed with activity. Special testing for carpal tunnel includes tapping on the nerve at the cubital tunnel eliciting tingling (called a positive Tinnel sign). Other provocative tests for cubital tunnel include pressing on the nerve at the tunnel or flexing the elbow (positive elbow flexion exam). Importantly, the surgeon may look for negative signs including neck compression (Spurling exam) or thoracic outlet or pronator syndrome. 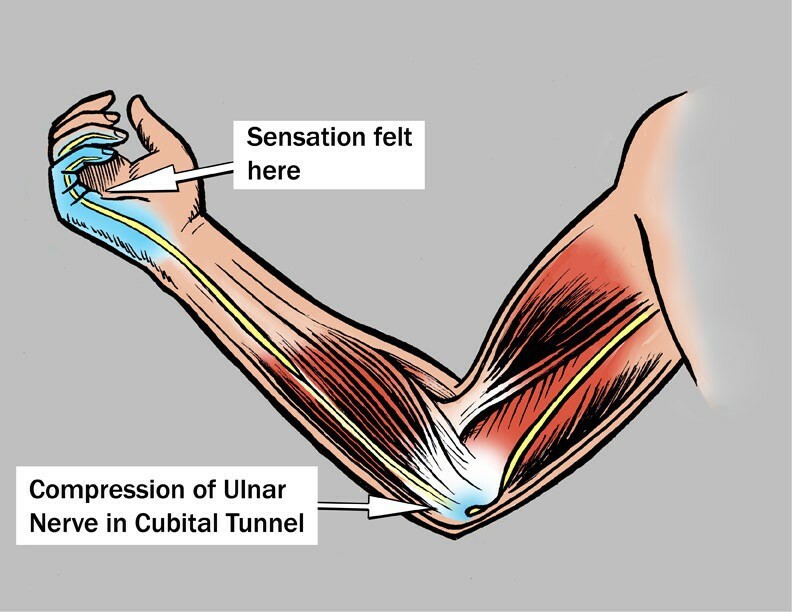 Flexion and Compression of the ulnar nerve at the cubital tunnel reproduces symptoms. Non-surgical treatment is typically indicated early in the disease or if the cubital tunnel symptoms are mild. Nonoperative treatment is typically more effective in these situations. Activity modifications may be helpful if the patient has vibratory exposure or repetitive hand gripping. Bracing may be utilized by your surgeon and is typically utilized at night for most patients. If symptoms are controlled by these measures, no further treatment is indicated. 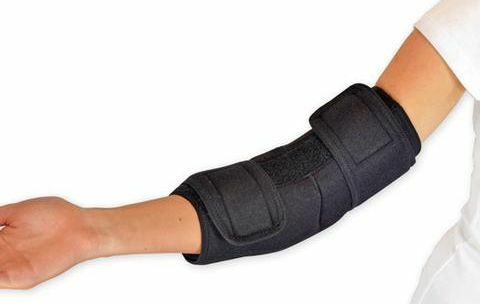 A brace to keep the elbow straighter at night which decreases compression on the ulnar nerve. 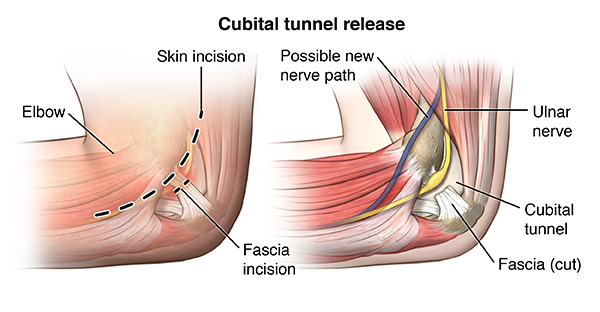 If the patient’s symptoms persist, despite nonoperative management, surgical treatment is the next logical step—called a cubital tunnel release. 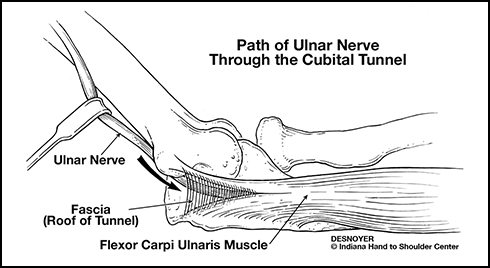 All surgical management is centered on decreasing pressure on the ulnar nerve at the cubital tunnel. Surgical treatment can be performed as an outpatient surgery, typically using regional anesthesia. A small incision is made on the inside portion of the elbow and the roof of the cubital tunnel is released—relieving pressure on the nerve. Many variations of the surgical procedure have been described, all with comparable good results. The need to transpose the nerve has been controversial—primary cases may not require transposition and there may be need for transposition with continuing symptoms if initial surgery did not improve the ulnar nerve difficulties. A cubital tunnel release and transposition of the nerve. Typically, recovery with transposition takes longer than with simply decompression. After surgery, a light wrap will be applied to your arm. In most cases, a dressing change is used and band aids are used to keep the incision clean and dry. 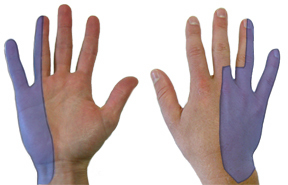 The patient may begin using the fingers and thumb after surgery for light activity and increase activity as tolerated. Sutures are removed in about 2 weeks and continuation of grip strengthening is emphasized. Because of the distance between the site of compression at the elbow and the symptoms which are at the hand—recovery can take many months. However, Night time sleeping is typically the first symptom to improve. Improvement of feeling in the digits moves from the site of incision and marches distally over time. The rate of improvement and overall recovery are inversely related to the severity of nerve pinch and its duration. Pain and discomfort decrease over time after surgery. Improvements in sensation and strength may continue up to 18 months after cubital tunnel surgery for severe cases. Hand therapy is typically not required after cubital tunnel surgery. Surgery for cubital tunnel yields good results in most cases. Results of treatment may be compromised by longstanding nerve compression or other nerve disease. Recurrence after treatment is uncommon, but may respond to additional treatment.